Ok, this crunchy taco bake recipe was a total surprise winning lunch in our test kitchen. 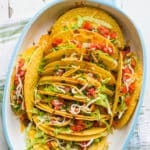 We had some leftover crunchy taco shells and a bunch of ground beef from a bbq project we were working on and what to cook with a all these extra ingredients? Crunchy taco bake, of course! Seriously, we’re all adults here but when we tasted these we instantly became kids again, or at least big hungry kids. 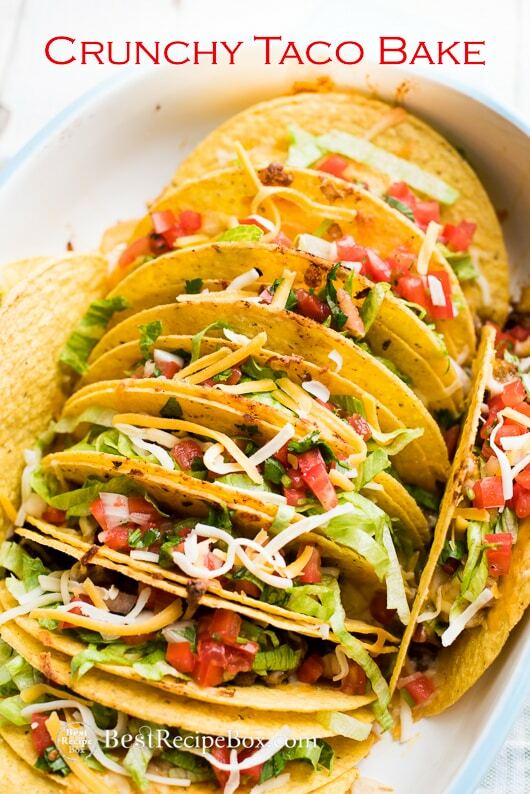 The flavors of our taco beef was fabulous and combined with the warm, crunchy taco shells with cool lettuce and salsa, it was a mind-blowing taco lunch that we’re totally obsessed with. Every once in a while we crave crunchy tacos because our go-to taco lunch are always with soft corn or flour tortillas. But today was a little different and we’re so glad we mixed up our taco-game. 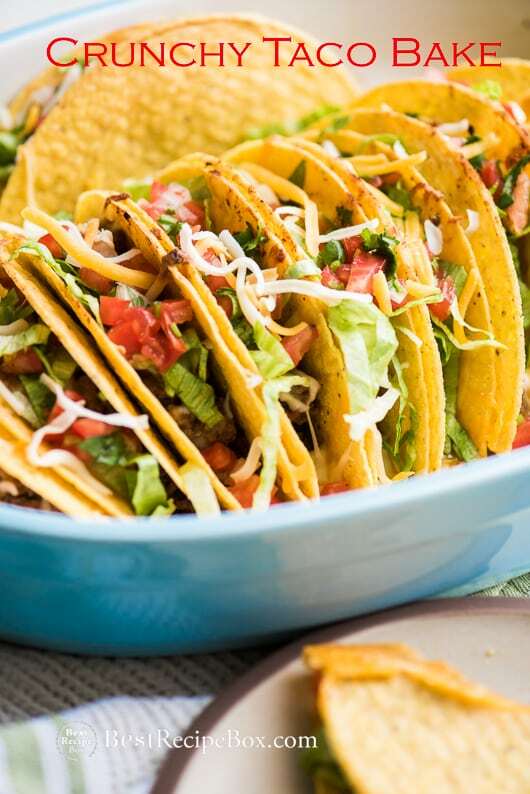 Watch How These Crunchy Tacos are Made! In fact, we just raised our taco-game ten notches with kids because they love this just as much as we do! Who doesn’t love a warm crunchy and cheesy taco? This recipe for our crunchy taco bake is perfect for game-day, weekends, outdoor parties or when ever you want to serve a hungry crowd. Seriously, you can easily put together 2,3,4 or 18 of these trays super quick and just pop them in the oven and you’re ready to feed your whole town if you wanted to. Why not? Cause the more people you can feed with these awesome tacos, the more heroic you’ll be in everyones eyes. You’ll be the taco hero that made a bunch of people happy. And oh, don’t forget to bring the keg of beer because these crunchy beef tacos pair perfectly with some fizz. For the kids, some lemonade or iced tea will suit them just fine as long as they can have 2-3 to eat all by themselves, which they will definitely devour in seconds. The amount of tacos you can make in a batch will depend on your baking dish. You’ll want the shells to fit fairly snug so they hold each other up. Our 3-quart baking dishes usually hold 12-15 tacos. Heat skillet on medium high heat. Add oil then add the onions and garlic. Cook until softened. Add beef and cook until brown. Stir in tomatoes, chili powder, cumin, salt, and pepper. Remove from heat and drain any excess juices. 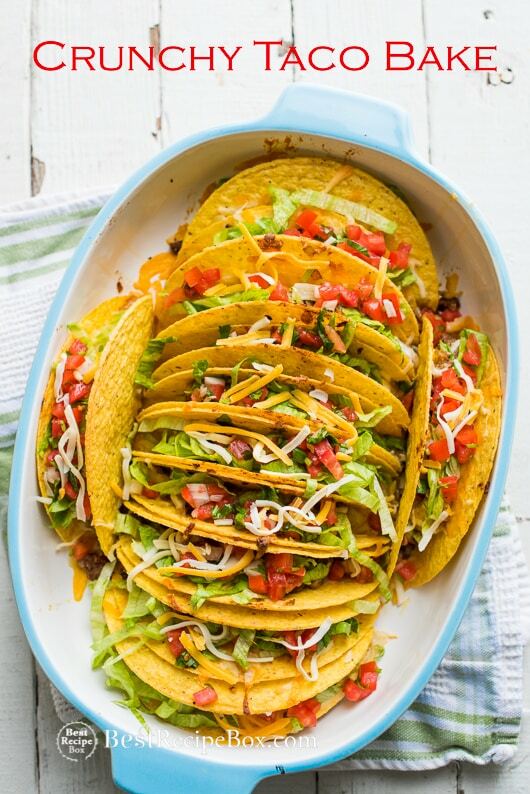 Arrange taco shells snugly standing up in an about 9x13" baking dish. Divide the meat mixture between all the taco shells. Sprinkle cheese over the tops of the filled tacos and bake for about 15 minutes, or until the cheese is melted and taco shells are crispy. Remove from oven. Top with shredded lettuce, salsa, cilantro, guacamole, sour cream or your favorite taco toppings! Serve with lime wedges.